If you got the song reference in the title, you get a cookie. On the second day of Christmas Collab, Kim asked of me: You’re wrapping presents while listening to cheesy festive tunes, and start to reminisce about holidays past. What’s your favourite Christmas gaming memory? This is sort of a tough one, because as much as I love video games, my life hardly revolved around them growing up, any more than it revolved around movies or other entertainment media. Christmastime was usually marked by cooking and baking, watching Christmas movies, and singing Christmas carols practically nonstop starting after Thanksgiving. Yes, those were all usually group activities, even the singing part. It was so much fun! But that’s not to say I don’t have any memories of games during Christmas. As some of you who have hung around here a while know, most of my favorite gaming memories revolve around gaming time spent with others. We (my siblings and I) usually received a game or two on Christmas, and once all the presents were unwrapped and the paper was recycled, the new shiny game was popped into the NES for us to play. Mostly them, since I was the smallest and they generally only wanted me to watch, but I still had fun. I think that’s one of the reasons I’m okay with simply watching others play video games; I was trained from a young age (haha). Playing the new game(s) with my family was always fun. And it got real once Tetris was brought out (or Tetris 2!!). This is a memory from new year’s, and not Christmas, but we have a picture of my dad holding the NES controller, and he’s concentrating very hard on the screen/new game from Christmas while my mom drapes him with streamers for new year’s eve. I also remember us talking about the music in Tetris, because it’s all of the classical variety. I think that’s why I was so little when I first learned about Bizet’s opera “Carmen,” to be honest, because one of the pieces from the opera plays when you clear the levels! Anyway… I think that’s what I liked best: while I played video games with my brother sometimes, or my mom sometimes, or my dad, or even my sister, the only time we’d really all sit around at the same time and play was during the Christmas holiday. All else aside, my favorite part of the holidays will always be time spent with my family, and although I might not have specific memories regarding gaming around the holidays, they certainly did have a place during the season. What about you? Do you have a favorite Christmas gaming memory? What is it? Let me know in the comments! 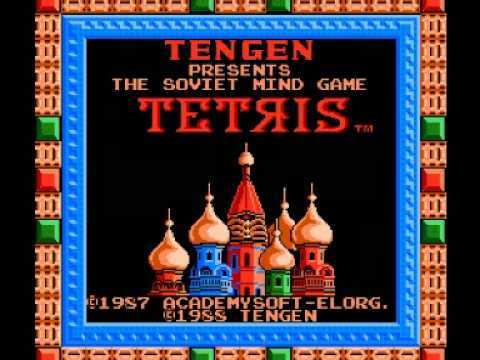 IM pretty sure my love of video game music feeds my love of classical nd vice versa 😆 I love Tetris’ music. All hail Music C! Oh wow, I’ve never seen that Tetris game before lol. Thank you for sharing your memories! Really? It’s the title screen from the NES, if I remember right… but yes, thanks for coming along for the ride down memory lane! Like Luna said above, thanks for sharing your memories. It definitely reminded me that, even if the holidays can be a stressing time, we need to leave room for the good things. Haha yep you got it! Indeed, sharing time with your loved ones is what matters on these dates. I’m not sure it was a “mind game” the way that sounds, but it was developed in the Soviet Union. It’s actually a pretty fascinating story. I just read an entire book about the history of Tetris that my mom gave me. In Soviet Russia, Tetris blocks stack you! …so sorry… I was dying to say that because I’m a loser… sigh.